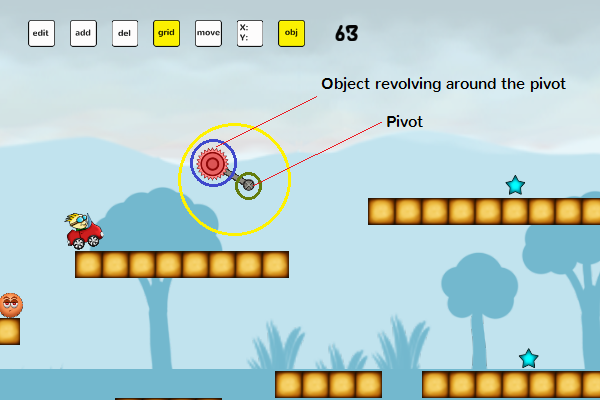 In our upcoming android game we are adding some box2d joints and in this post we would be creating a revolute joint. We are using Libgdx engine to make the game. Below is a screenshot of what it looks like in game. At the end of the post, you can find the source files for this revolute joint example attached. Okay, a small description about revolute joint. It works with two bodies with one acting as the pivot while around revolves around it. With box2d we get the option to limiting the angle range in which the body revolves and also set the torque (how fast the body rotates about its origin) and motor speed (how fast the body rotates around the pivot). Here is a snippet of the respective joint. Lets go through the above snippet. We first supply two box bodies which would form the revolute joint. Third argument (collideConnected) is to check if the two bodies associated with joint should be checked for collision. SetAnchorA is to set the anchor point around which the revoluting body will rotate. SetAnchorB is to set the other point where the second body will be positioned and will revolve around the pivot. SetAngleLimit is to set the range in which the body should revolve around the pivot. In SetMotor function we are setting the torque and motorSpeed for the joint. In our case we wanted the body to completely revolve around pivot every 1 second, so we give the speed of 360 (which is converted inside to radians as box2d expects the angles in radians). Below is an image which (tries to) describes the revolute joint. Below is a snippet to create a revolute joint using two bodies. First a wrapper class to create box2d bodies. In the above snippet we are creating a circle object. We are scaling the objects to ratio of 1:100. So if a world object is 50px wide then in box it would have a dimension of 0.5f. So while creating the body we convert the dimensions and location in box2d scale and in debugrenderer we scale the projection matrix by 100 to see the bodies in world dimensions. Bodytype is to specify if a body is static, dynamic or kinematic. Our pivot will be static and other body will be dynamic. Other properties are set to 1 or 0 but as for this example they were not that important. Now the main code where we create the box2d bodies and revolute joint. In the above snippet first we create the two box2d bodies which will form the revolute joint. Then we create the joint and set the pivot and other body apart by 100 px. 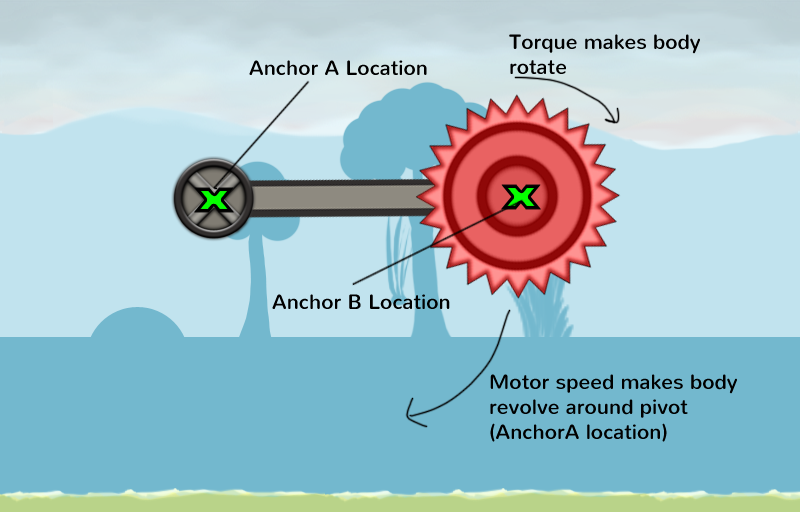 Then we set the torque to 20 and motor speed to 360 degrees per second so it will complete one revolution per second. Then all you need to do is call world.step in update function to update the box physics and the joint will work accordingly. Here are the source files and the libgdx eclipse project. We have used debug renderer in the source provided. If you have queries/suggestions, please post them in comments.